Although this was my first time making them, I’m beginning to think that these pumpkin spice doughnuts are going to become a fall tradition around here. Filled with cinnamon, ginger, nutmeg, cloves, and even a hint of cardamom, these doughnuts will warm your soul on a crisp autumn morning. Have you ever made doughnuts from scratch? The closest I had ever come to making doughnuts was back in my college days when I learned how to make faux doughnuts (fauxnuts?) 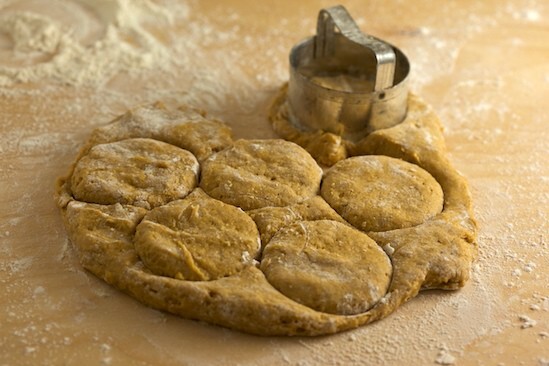 by poking holes in refrigerated biscuit dough rounds and frying them up in a skillet. They were pretty good if you dipped them in sugar and ate them warm, but not quite the real thing. Ok, not even close. I do have memories of the real thing, though. You see, my mom made homemade doughnuts for us once. They were yeast-raised doughnuts, the kind which are lightly glazed or sugar-crusted on the outside, but only slightly sweet and impossibly soft and fluffy on the inside. Though I was small, and the recollection is a bit fuzzy, I know in my heart that they were the best doughnuts I’ve ever tasted. While the “hot now” sign at Krispy-Kreme may make your heart flutter, I’m telling you that nothing compares to a doughnut fried up in your own kitchen. My mom only made doughnuts once that I can recall, but that one memory fills me with so much warmth, I know that I have to make doughnuts from scratch one day for my own children. Yes, food memories are powerful. My favorite doughnuts are yeast-raised and glazed, and rarely do I stray from that standard when visiting a local doughnut shop. But after deciding to make doughnuts at home, I thought it would be best to start with a simple cake doughnut on my first go-round. And while I generally prefer plain cake doughnuts to flavored ones, I decided to give pumpkin doughnuts a try when I noticed that the leaning tower of organic canned pumpkin that had been perched precariously on my counter since that last trip to Trader Joe’s (when rumors of canned pumpkin shortages briefly got the best of me), was finally threatening to topple and, perhaps, hurt someone. After looking through several pumpkin doughnut recipes, I chose to use one from Bon Appetit found on Epicurious. And since I can never leave a perfectly good recipe alone, I made a few changes like doubling all the spices and adding a touch of molasses. I also chose not to add the white glaze, and instead dusted the finished doughnuts lightly with powdered sugar mixed with a bit of pumpkin pie spice. They were absolutely delicious! The dough is very sticky when it’s first mixed, so you need to chill it in the refrigerator for a few hours before you can work with it. The next step reminded me a lot of making biscuits, and in fact I did use a biscuit cutter. 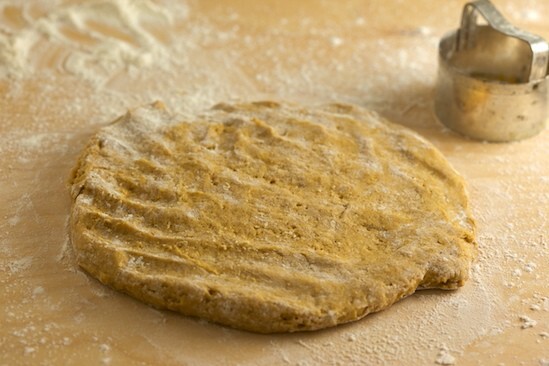 Just dump some of the dough out onto a lightly floured surface, then pat it out lightly with your hands. Since the dough is still rather sticky, even after refrigeration, I dipped the cutter in flour before cutting each round. After you cut out some rounds, it’s time to cut the holes. I wasn’t sure what to use, since I don’t have a one-inch round cutter like the recipe specified. But I do have an apple corer, and it worked well, even though the holes were a bit smaller than one inch. Again, I made sure to dip the apple corer in flour before cutting each hole. When deep-frying, you need to make sure you control the temperature of the oil. Although it’s hard to keep it at the same exact temperature all the time, you should adjust the heat to try to keep the oil between 365 and 370 degrees as much as possible. If it’s too cool, the doughnuts will absorb too much oil and if it’s too hot, the doughnuts will brown too fast and the middles won’t be fully cooked. Make sure you have a thermometer clipped to side of your pan to make it easy to monitor the temperature of the oil. Cook the doughnuts in batches, without overcrowding the pot. Adding too many doughnuts at once will cause the oil temperature to drop rapidly, resulting in greasy doughnuts. Cook the doughnuts until they are golden brown, then remove with a slotted spoon to a tray lined with paper towels. 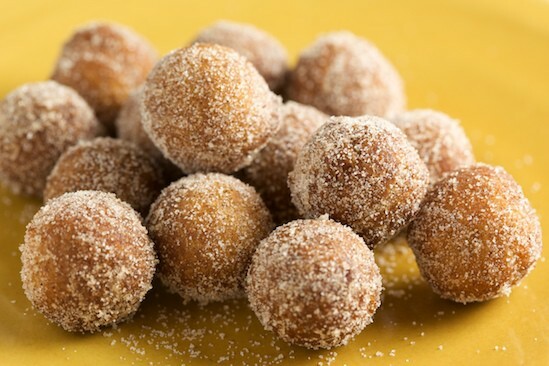 After the doughnut holes have cooled, they can be rolled in cinnamon sugar, or whatever topping you decide to create. 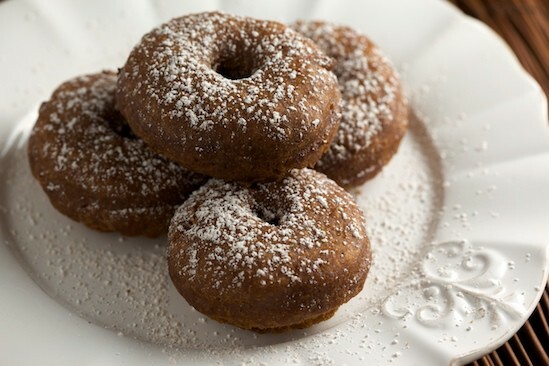 I decided that I like these pumpkin doughnuts plain, but I did sprinkle a few with powdered sugar and a dash of pumpkin pie spice. Perfect! 1. Whisk first 9 ingredients (flour through cardamom) in a medium bowl to blend well; set aside. 2. 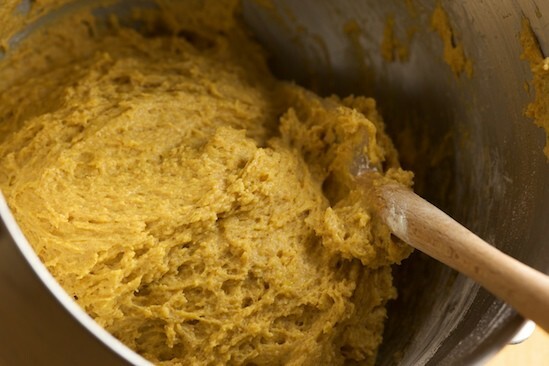 Using an electric hand mixer or stand mixer, beat sugar and butter in large bowl until well blended (mixture will be a bit grainy). Beat in egg, then yolks, then vanilla. 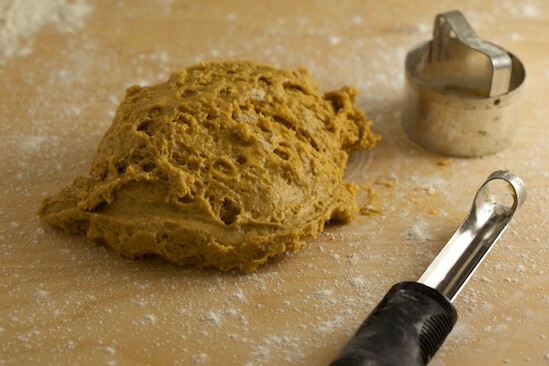 Gradually beat in buttermilk and molasses, then beat in pumpkin, in four additions. 3. 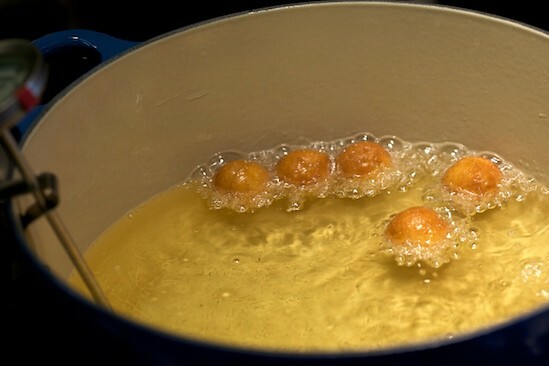 Fold the flour mixture into the egg mixture in 4 additions, blending gently after each. Cover the bowl and chill in the refrigerator for at least three hours. 4. Lightly flour two baking sheets. When dough is well-chilled, lightly flour a work surface. Starting with about 1/3 of dough, gently press it out to a round that is 1/2- to 2/3-inch thick. 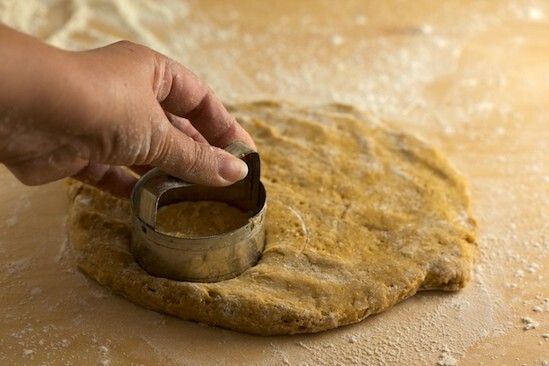 Using a 2 1/2-inch-diameter round cutter, cut out dough rounds. 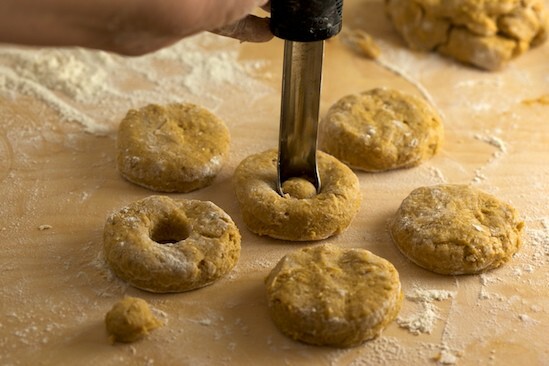 Using 1-inch-diameter round cutter, cut out center of each dough round to make doughnuts and doughnut holes. Arrange doughnuts and holes on the baking sheets as you go. Gather dough scraps. Press out dough and cut out more dough rounds until all dough is used. 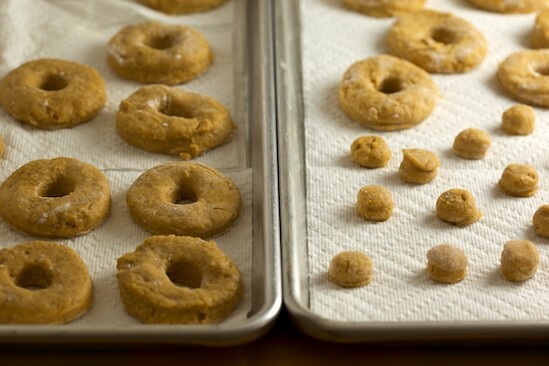 If dough is very sticky, dip the round cutters into flour before cutting each doughnut. 5. Line two baking sheets with several layers of paper towels. Pour oil into large deep skillet or dutch oven to a depth of 1 1/2 inches. 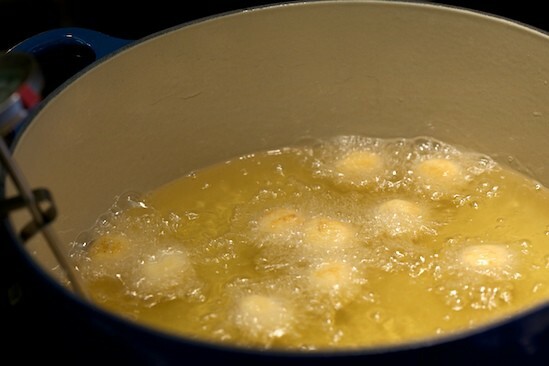 Attach a deep-fry thermometer to the side of the pot and heat oil to 365°F to 370°F. 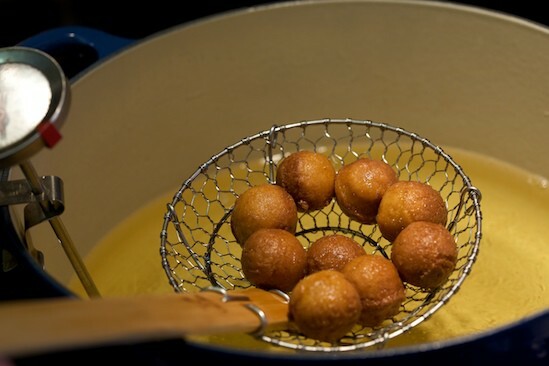 Fry doughnut holes in 2 batches until golden brown, turning occasionally, about 2 minutes. Using a slotted spoon, transfer to paper towels to drain. 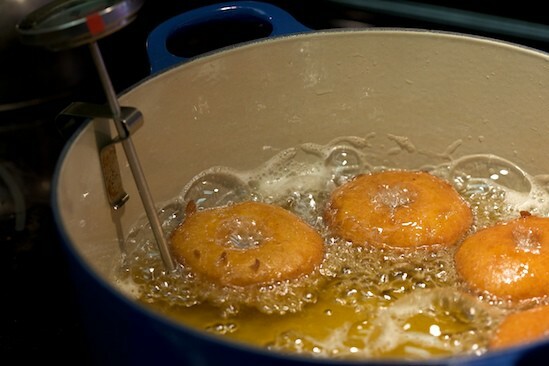 Fry doughnuts, 3 or 4 at a time, until golden brown, adjusting heat to maintain temperature, about 1 minute per side. Using a slotted spoon, transfer doughnuts to paper towels to drain. Cool completely. 6. 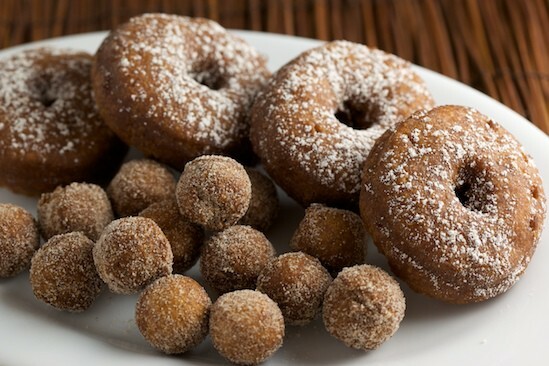 While doughnuts are cooling, mix sugar and cinnamon. Roll doughnut holes in the cinnamon and sugar mixture. Lightly dust doughnuts with powdered sugar, if desired. Pumpkin Donuts with Pumpkin Cream Cheese Frosting from Pete Bakes! Oh my...these look wonderful. I've been wanting to try donuts at home for some time now. Bookmarked the recipe! Woman, you're killing me. I'm off to London, where they just don't do *anything* pumpkin, and it'll be at least 3 weeks before I can attempt this. I teared up a bit just looking at your photos. They're so gorgeous, and you're gorgeous for sharing your take on the recipe. Yum... These donuts look amazing. Your step-by-step pictures are absolutely beautiful! Those tiny donut holes are absolutely adorable! Making a pumpkin variation sounds delicious. whoa, this looks amazing. makes you think you could almost get away with eating a donut or five if they have something great for you in them like pumpkin. Oh, my, these look wonderful and your narrative is wonderful. I have a huge phobia about boiling oil. More power to you, though! Oh my sweet lord. These are perfection. And its neat how you used your le crueset as a fryer--I hadn't seen that before. My god - they look and sound delicious. For some reason frying really scares me - perhaps I need to face my fears and get my doughnut groove on. They look delicious! You inspired me to try them! Oh my god, these look delicious. I'm thinking these and some hot cider would be divine. These look waaaaaaayyyy too good. These are my new favourite!!! Tim Hortons makes a pumpkin cake doughnut too but I am sure homemade is much better!!! Donuts are not my #1 favorite thing in the world, but my-oh-my these look delicious! I think I need to make some. Right now. I have never in my life made doughnuts, only consumed far too many from other establishments. This posting and the feel-like-I'm-there photos have tipped me over the edge and I'm making these bad boys tomorrow! Thank you for your versatility, adept hands, and creativity. YUM! I too have wonderful memories of donuts: only my grandmother would make potato donuts whenever we visited! These look positively sinfully delicious and I may have to try this weekend!! Hmmmm looks good, especially this time of year. I've made something similar. I'm going to use your recipe sub with whole wheat flour and splenda brown sugar blend. I also use agave nectar with a bit of maple extract for faux maple syrup or molasses. Then the diabetic (me me) can have her "cake" donut and eat it too! Such a cute post. Thanks for including my baked pumpkin donuts to your list. MMM. So yeah, whats the deal with the pumpkin shortage? I stocked up and I dont even like it and its in all the shops! !I'd love to swap places with amber since I'm not such an enormous fan of pumpkin, I hope she find beas of bloomsbury, they have tons of yummy pumpkin stuff! I've made the dough and it is sitting in my fridge and it's taking everything I've got not to drop it in the pan right now. thanks for sharing! Yum! I've been wanting to make doughnuts, but haven't gotten around to it yet. I was thinking cider doughnuts, but these may have just moved to the top of the list! I want to make doughnuts but I have been afraid of them. They look so doable that you have convinced me to try them. I owe you. Ooooohhhh.... I.will.make.these.this.week. ifnothing else but the fact that i can't stop thinking about the "hot" sign at krispy kreme that i've never even experienced!about how many of these lovely treasures does this recipe make? you think i could easily double it ? Wow. I think I need to make these. I've always wanted to make doughnuts at home but never have -- these look like the perfect first attempt. Your first doughnuts and they look spectacularly pefect! Congratulations. I am an admitted doughnut addict. Have never made them at home because I fear... oh I fear that I will never stop. WHY do unhealthy things have to look (and taste) so good? I will simply have to make these. Made these for work and to welcome in the fall. WOW! THEY ARE AWESOME!! I'm convinced we ate like 10 doughnut holes while we were making them. I work as a waitress and have been actually writing this website down for customers. Fantastic job. I love being a fan of this blog. I'm so excited to make these for a Thanksgiving dessert buffet. Between all the pies and truffles I think these will be a nice addition!!!! I'm also glad you amped up the spices ... i love these fall flavors. I knew there was a reason i liked October. Thanks for sharing. Yes these are fantastic, family loved them tonight! Thank you. Happy New Year!